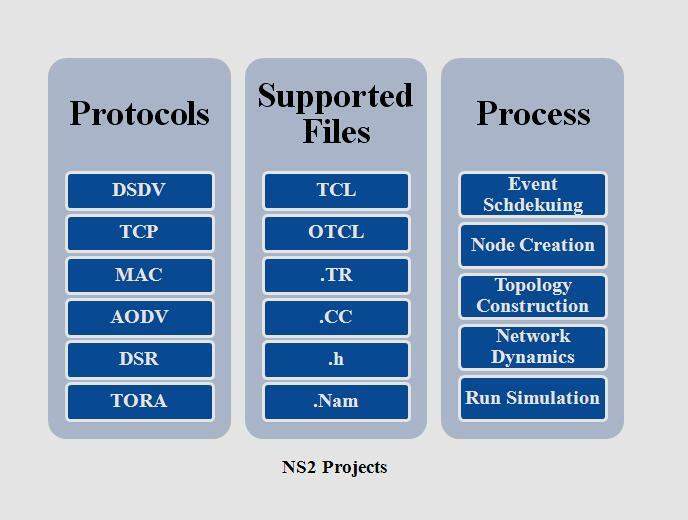 NS2 Projects is a one of the efficient simulation tool to implement and analysis network environment. We implement NS2 projects code in C++ (or) TCL based object oriented programming languages. By using this language we can split data path and control flow path process. We developed more than 80+ NS2 projects code to model network protocol such as DSDV, AODV, DSR, TORA, MAC, and TCP. We support virtual internet testbed, college and research projects. It contains various library functions and protocol design. Event scheduling is performed by NS2 and maintains data structure with event management applications. We use C++ and OTCL to implement NS2. C++ used as backend to create M.Tech projects with high speed and efficiency. It ensures byte manipulation, implementation of algorithm and packet processing. OTCL is used as front end setup. It implemented to configure object, simulation tool setup and scheduling process based on IEEE papers. Simulation objects are created by set ns command. To set file format for tracing use set trace-nam and set trace-all. Input file traced by “$ns namtrace-all $tracenam “or” $ns trace-all $trace-all”. We guide and explain students about code to create topology. Nodes are easily created by this tool. To create node set no (or) $ns to create number of nodes. Links are provided to inter connect a different nodes. For eg: $ns duplex_ link $n0 $n1 1Mb 10 ms red to connect node1 and node2. Duplex means communication, Mb means packet size and ms mean packet speed travel in link and red mention color. Programming language in network simulation used to denotes the link failure and modification of route in networking by $ns rtmodel-at <time> up/down $no $n1. Every event schedule as $ns <time> <event>, Events are denoted as TCL. Simulation is run. We start and stop simulation with timing $ns at 0.5 “$CBR start” and stop by $ ns at 0.5 “$ CBR stop” by finish the simulation we use $ns at 0.5 “finish”.